CMO Asia organized the 6th Asia Best CSR Practices Award in Pan Pacific Hotel Marina, Singapore last Friday 5th August 2016. This annual event regularly identify amazing and passionate individual and also highly committed company that match their indicators for several title award that all related to Sustainability. There are 3 individual award granted for asian professionals, one of them is "CSR Leadership Award" whereas one of our founder name selected as the receiver. 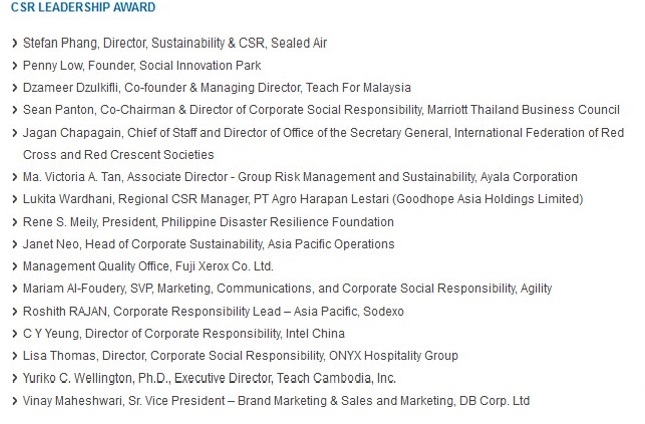 Mrs. Lukita Wardhani, is selected to be one of "CSR Leadership Award" for her works in CSR practices. For her this is a second award received this year of 2016, before she also received citation of "100 Most Impactful CSR Leader" by the World CSR Day in Mumbai, India last February 2016.